This following post details the challenge for Columbia Impact 2017. BlocPower is a proud sponsor and looks forward to seeing the great ideas generated by the teams. Good luck and have fun! While performing energy audits on New York City buildings, BlocPower has learned a great deal about the environments in which people live and work. 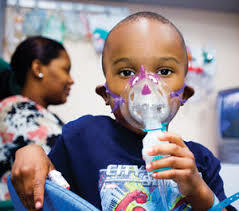 A huge issue we’ve discovered, outside of our energy efficiency work, is indoor air quality (IAQ). Humans spend most of their time inside, and the air we breathe has enormous impact on our health and ability to be productive. 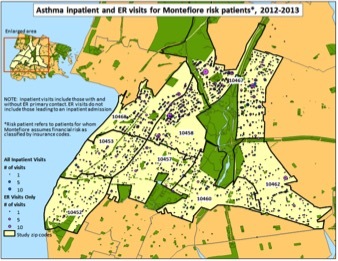 Air quality problems are especially prevalent in low-income communities like certain parts of the Bronx, where the rate of hospitalizations for asthma are 21 times higher than in more affluent parts of the city . The increase in hospital visits strains an already delicate and expensive healthcare ecosystem, as well as impacting peoples’ ability to work and go to school. This is a problem the city government is aware of, and a bill was introduced this week to collect more data about asth ma rates within the city . While measures like this are important, the government alone is not equipped to solve the problem. For example, government funded public housing in Red Hook is still suffering from mold that originated from flooding during Hurricane Sandy in 2012 . As climate change continues, and the severity of storms increases, this problem can be expected to get worse. 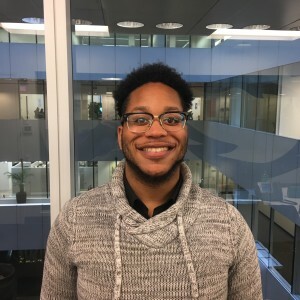 This problem encompasses a large population of the city, and a solution would provide clear economic gains from infrastructure improvements as well as increased worker productivity and wellness. BlocPower is hoping to inspire innovative business and product ideas to improve IAQ and quality of life for the citizens of New York, particularly in disadvantaged communities. The current strategy for addressing IAQ problems in these areas is through 311 complaints. Contractors will come to remove the mold and plaster o ver it. These repairs are done through the New York City Housing Authority, and are sometimes incomplete or totally unaddressed. The entire process can be time consuming and frustrating for tenants. In addition, many of the buildings are old and underserviced, meaning that the building standards at the time may not have been as strict on ventilation. The ventilation required in more modern buildings makes them better equipped to prevent these issues in the first place. One of the big tech developments that may help is the decreasing cost of air quality sensors. High resolution air quality data, both indoors and outdoors, could help diagnose air quality issues and make source management more seamless. Some strategies attempt to involve and empower the community to make change, often through education and local events. 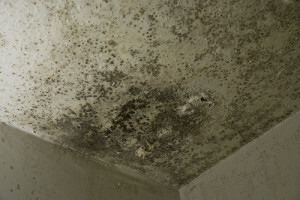 In 2010, a toxic mold task force commissioned by the city issued a report on mold conditions in the city . The report is filled with data and recommendations for standards and actions to be taken by the government, which might help with idea generation. The city also publishes all of the 311 calls it receives, and the dataset for IAQ calls may give insights on both the types of complaints and the areas of concentration . You are also encouraged to find your own sources and information, as there is a lot of available insight on the topic! 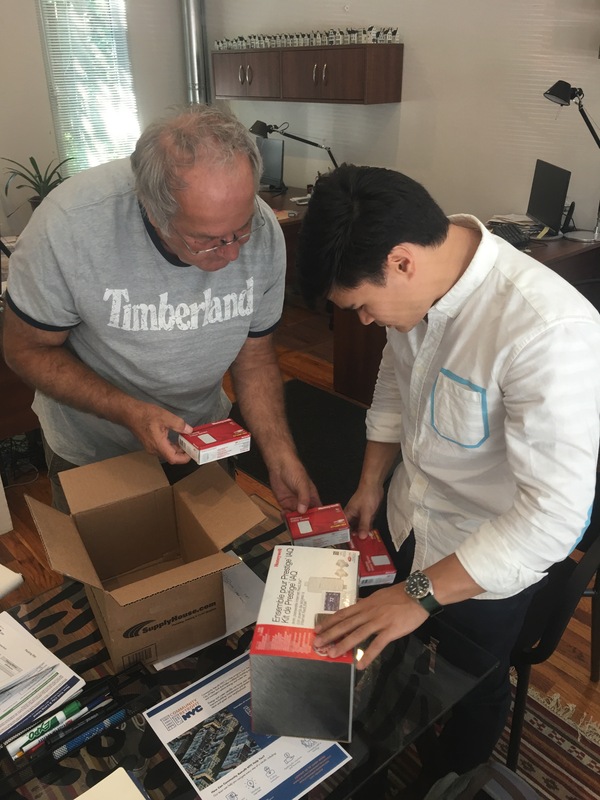 In preparation for the fall heating season, BlocPower’s Community Retrofit NYC team has been all over Brooklyn this summer helping building owners and contractors prepare. 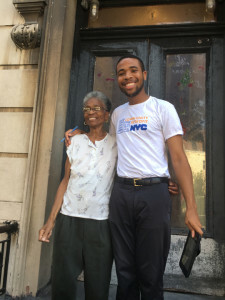 The team canvassed weekly throughout East New York, Bed Stuy, and Bushwick meeting nearly 200 new building owners along the way. Whether installing a new boiler, upgrading a thermostat, or navigating the vast world of government incentive programs, the Community Retrofit team is eager to tackle the complex problems facing New York City’s building owners. 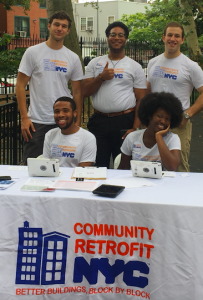 Our team collaborated with Brooklyn Assemblywoman Latrice Walker to host an event on July 27th for building owners at Marion Hopkinson playground in Bed Stuy. We met 23 new building owners who were connected with our free energy assessments and consulting services. These building owners were able to access a wide variety of services from our partner organizations including free LED lighting from Con Edison, free low flow water fixtures from National Grid, and the Green Housing Preservation Program. 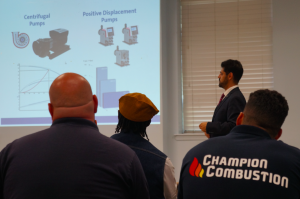 On August 10th we hosted a contractor training event to educate contractors about energy efficiency and help them expand the scope of their business. We brought in industry experts including Grundfos, Rathe Associates, and Venco to discuss new building technologies and energy efficiency best practices. This event helped grow our pool of qualified and experienced contractors to assist our clients with retrofit projects. As the fall heating season approaches, Community Retrofit NYC is here to help! Contact us to learn more about the free services available for your building(s) at info@communityretrofit.org or 347-762-4792. BlocMaps is finally in the hands of the New York City residents who need it most, and our customers are ready to save money on their building gas, heating oil, and electric bills. This week, the BlocPower team deployed BlocMaps in the field for a long-time resident of Brooklyn. With the power of our predictive energy consumption model at her fingertips, our customer was able to visualize her building’s performance and better understand her energy needs. Continue reading We Can Help Building Owners Lower Bills Today! Posted on July 17, 2017 Author Neda ArabshahiCategories Building Owners Save Money, Community Retrofits, Staff Picks, TechnologyTags BlocMaps, BlocPower engineers, BlocPower Mobile App, Brooklyn, Building Engineers, building retrofits, CBRA, Community Retrofit NYC, Homeowners Save Money, Lower Your Utility Bills, New York City, NYC, retrofitsLeave a comment on We Can Help Building Owners Lower Bills Today!